Among the many things to change for her that evening are: her physical appearance—from ghastly to breathtaking, an epidemic of night terrors predicting the future, and the blue-eyed man’s unexpected infusion into her life. Not only do his appearances precede tragedies, but they are echoed by the arrival of ravenous, black-robed wraiths on moonless nights. The only reason I'm not giving this book 5 stars is because I wanted MORE - and I truly felt at times that Crystal could have elaborated more on a storyline. But that's really the only thing even close to a negative I can say about this book. I can only hope that the small holes in some of the characters' backstories is because there's a prequel in the works. That would make me IMMENSELY happy. Alexia's world is forever changed on her 16th birthday. She seems to transform into a beautiful being that she hardly recognizes in the mirror, but she discovers a world that she never dreamed existed - and that's she is a part of it. Orcould be if she chooses to be. This book is filled with heart pounding terror (Bellezza absolutely terrifies me), heart wrenching love and heartbreak, dark family secrets, and creatures that pretty much want to eat your soul (but Bellezza is still scarier!). I had nightmares, but it was worth it lol. 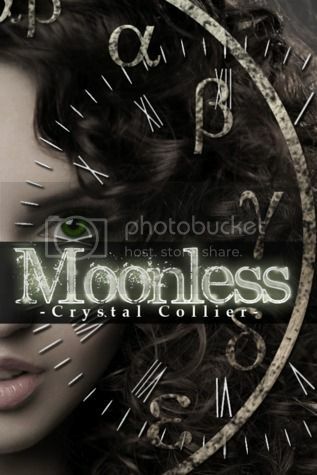 "MOONLESS is powerful, compelling, and packed with soul. So many threads, such rich backstory. Such amazing world-building. It was familiar England, yet always hinting at a sense of Otherness. Made me wonder if those things had really been there all along and I missed them." --Bethany Kaczmarek, A Little Red, Inc. I can't wait to read this book. So excited for Crystal. And nightmares? Uhoh, I'm ducking. Thank you for sharing your perspective. Good job Crystal!